Several years ago when I toured the Vatican, my favorite art was not in the Sistine Chapel, but in the libraries preceding it. There, the masters of trompe l'oeil (visual deception in painting) plied their crafts on the walls and ceillings to make these flat surfaces look like spacious domes and arches. Take it from me, it's fun to have your eye fooled! But you don't have to go to Rome to see a present-day trompe l'oeil master. My favorite ex-pat oil painter, Georges Willett, has put me on to Eric Grohe -- an artist from Marysville, Washington. Eric is an "eye-fooler extraordinaire." He does large murals on (often dilapidated) buildings and brings them to life. 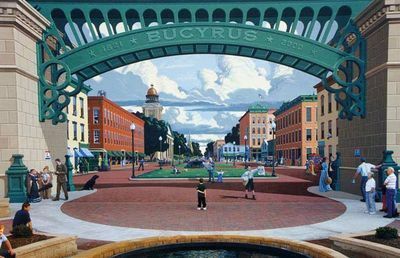 Here's an example from Bucyrus, Ohio (before and after). If you'd like to see many examples of Eric "fooling the eye," check out his site. Today's "Creative Think Hat's Off" goes to Eric Grohe: he has a lot of fun making the world a better and more whimsical place.